UBtheCURE is an organization I founded with the purpose of marrying my commitment to my faith, human rights for all, and optimal public health. We are an organization that seeks to treat people, not disease. Therefore I’m sure it comes as no surprise that my favorite quote from Dr. King, a man of deep faith, is one about justice and healthcare. It’s also not lost on me that his words were spoken in Chicago where I was trained, before the Medical Committee for Human Rights (MCHR), a group of American health care professionals that initially organized in June 1964 to provide medical care for civil rights workers, community activists, and summer volunteers working in Mississippi during the “Freedom Summer” project. There was no video, audio, or transcript of his speech when he spoke these words before the 2nd National Convention of the MCHR in 1966. In fact they weren’t words that he’d rehearsed, but thoughts that he offered during a press conference before his actual speech. As with even the most gifted orators, speaking “off the cuff” often leaves our words less eloquent, but more authentic. This quote that I have internalized is actually a victim of years of the game “telephone” where it has been refined and streamlined with every passing ear. According to the dictionary, ‘inhuman’ and ‘inhumane’, have the same base meaning: cruel and insensitive – lacking in compassion; but the dictionary goes on to further define inhuman as monstrous or barbaric. They cannot be interchanged. They must be used in different contexts. Think of it this way: the opposite of inhumane is humane, or possessing compassion, kindness, or mercy. The opposite of inhuman, is human. To be inhuman means to lack all human qualities, not only compassion and kindness. To be less than human as people of color have so long been categorized. To be likened to animals, or 3/5ths of a white man and therefore not entitled to the full scope of comprehensive care for our health and wellbeing. Make no mistake about it, while we celebrate the life and the legacy of a man who has long since spoken his last word, these words of the Rev. Dr. Martin Luther King Jr. still ring true today. 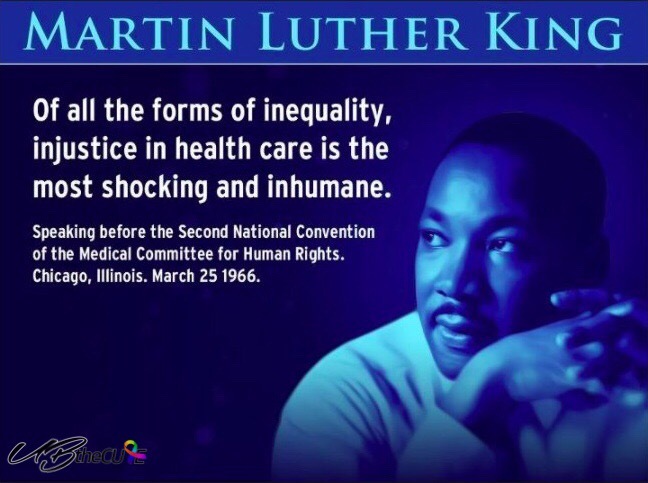 Of all the forms of inequality, injustice in health IS the most shocking and the most inhuman*. As we continue to #resist a federal government that is determined to strip health care and social services from the sick, the poor, the black and brown, the young and old, and the female among us – remember my favorite words from Dr. King, and remember them correctly.